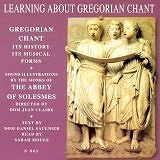 Offering chants sung with superb skill by the Monks' Choir at Solesmes Abbey, under the direction of Dom Jean Clarie, the recording is an informative overview of not only the history of Gregorian chant, but also its proper place in today's liturgy. Explanatory texts by Dom Daniel Saulnier (translated from the French by Jeremy Llewellyn) are read by Sarah Moule between complete selections of chant from various Solesmes recordings. The CD Learning about Gregorian Chant: Its History & Its Musical Forms (time: about 70 minutes) would make an effective meditative seminar for a retreat, day of recollection, or music workshop, as well as a perfect addition to a parish or seminary library. It is also very useful as an individual tool to delve into the wonders of this truly liturgical music. With clear singing, wonderful acoutics and helpful explanations, this CD can be an effective introduction to chant as the ultimate Traditional Music for the Contemporary Church!